Congrats, Mom! You survived the Holidays. You decorated your house, baked cookies for Santa, Heck, you even managed to get your family matching PJ’s in time for the annual Christmas Tree IG photo. But now, as we’re entering the first week of February and the mountains of wrapping paper and empty boxes have finally vanished from the recycle bin, it occurs to you— it’s time to splurge again! But this time, for your #MomTribe— You know, those badass fellow mommies that manage to keep you sane when motherhood feels like everything is too much? Yes, those ladies. They deserve some love too. The good news is, we’ve done the homework and compiled a list of awesome Valentine’s Day, er, Galentine’s Day options for your tribe. What’s more, the following products are all by mom-owned brands, the majority of which are headquartered in Los Angeles. 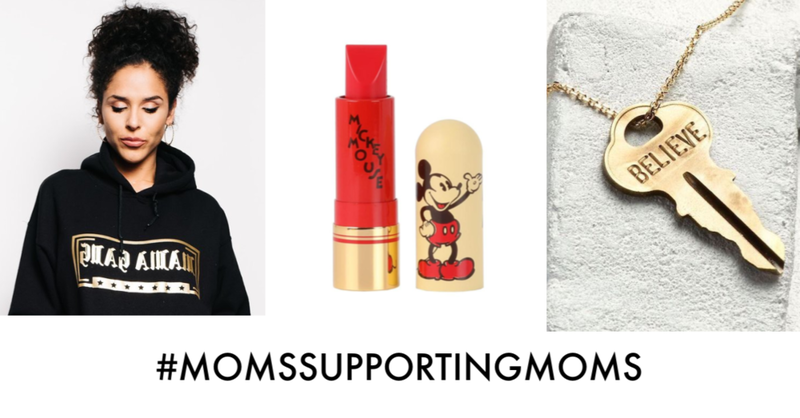 We really dig the following finds, because we feel they take our idea of #MomsSupportingMoms to level 1,000. Happy Shopping and Happy Galentine’s Day! They’re comfortable, easy and priced just right. The following tops & sweaters are brought to you by local #mombosses who’ve each launched their own L.A.-based mom support networks and designed fashionable pieces to complement their brands. The Mamahood Tee — The lady behind the Mamahood Tee, Dre, designed this t-shirt with Old English lettering that offers a cool L.A. street vibe. She created the t-shirt as a way of showing appreciation for her own “mamahood journey (with ZERO kids)”. Dre has created a mom-support network and has made her product “the tee that pays it forward” with t-shirt proceeds going toward helping moms invest in self-care. For more information/to purchase a Mamahood Tee, click here. Expressing Motherhood Merch — If you haven’t made it out to one of Lindsay Kavet’s “Expressing Motherhood” stage shows, then you’re missing out on a powerful evening of mom stories. The good news is, you can still support the production by purchasing Expressing Motherhood merchandise like t-shirts and hoodies. Visit www.ExpressingMotherhood.com to learn more. Sphynx 3-in-1 Portable Razor — This product is genius. The mom founder of Sphynx, Leila Kaishiani, figured it out for all of us. She created a click-and-twist disc that contains a razor, a sprayer bottle and a shave bar so we can get rid of that sneaky patch of hair that appeared on our knee as we were headed to date night. When juggling a shower and mommy duties becomes too much, it’s Sphynx to the rescue. $15 www.ShopSphynx.com. The most famous mouse in the world happens to live in SoCal (Disneyland was Walt Disney’s first theme park, which opened its doors in 1955) Many L.A. Moms know the mouse very well and visit him often which is why we figured that if your Disney-lovin’ mom friends receive one of the following gifts, they’ll live happily ever after.